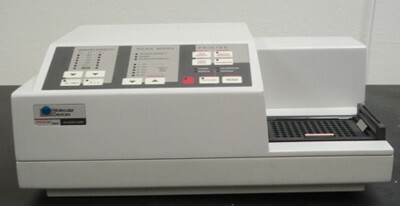 Thermomax model provides thermal control and vertical shake, perfect for kinetic readings involving growth curves, 400-750nm Spectral Range. 5 second read per plate. Single or dual wavelength read, kinetic readings, automix (shake), and endpoint, and blank pattern, curve fits included with PC Software. Measurement range 0.000 to 4.000 OD with 405, 450, 490nm filters installed and each filter documented and certified. How can I get the installation software for Molecular devicesThermomax Microplate Reader? My e-mail address is: kade_joseph@yahoo.com Thanks. There are no threads in Molecular Devices ThermoMax Reviews at this time.